France is at a crossroad. A fairly benign bread-and-butter protest has turned into a major popular dissent putting in question France’s political system. 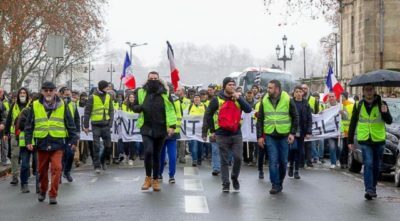 It is new, unheard of, and because we live in the digital age, with immediate communication, the world is not only watching, but there is a contagious factor to it, which in the Anglo-Saxon world is called “Yellow Vests Movement”. In what could be a healthy contagion of a social yellow fever of dissent, this polymorphic movement has already spread to 25 countries and counting. 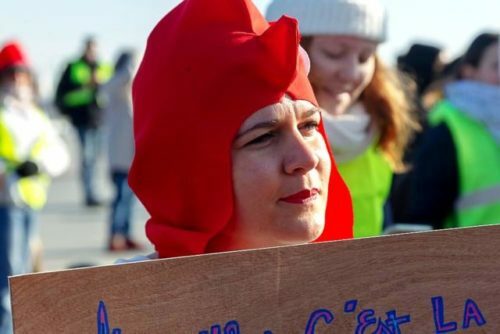 In the immediate vicinity of France, of course, in countries such as Belgium, The Netherlands, Germany, Spain, but also while not clearly identified as Gilets Jaunes chapters in Hungary, Bulgaria and Serbia. It has reached the Middle East with activities in Israel and Iraq, and the Americas with startup movements, still trying to structure themselves, in the United States and Canada. Is this explosion of dissent merely some short lived copycat effects or is a deeper systemic change in process or, in another word, the catalyst of a historical paradigm shift in real time? France is, for now, the main social battle ground, and critical test of the movement. The Gilets Jaunes protesters have faced brutal police repression from the Macron administration. 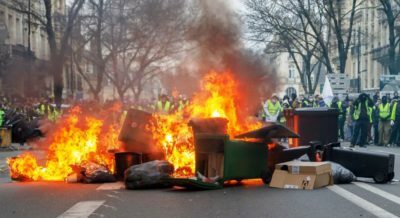 The “Macronie”, as some Gilets Jaunes say with humor, has not reacted to what the French mainstream media call “les casseurs” violent actions to diffuse the crisis, but instead has decided to used brutal force which was met by the condemnations of human rights organizations such as Amnesty International. Eleven Gilets Jaunes have died so far, and more than 250 have been seriously injured, often crippled for life from the excessive use of rubber bullets and explosive tear gas grenades. This never seen before level of police brutality, not condemned by France’s mainstream media, is utterly shameful in the country that invented the principle of universal human rights declared in June 1793 regardless of race, religion and gender. Nasty “Brave New World”, indeed, with the brutal globalization of governing corporate elites and their respective political servants, media sycophants, other proxies and finally their mercenaries. This cannibalistic global capitalism has failed populations worldwide, and brought a lot of people to the condition of modern day slaves. Slavery or feudalism was always the ideal social structure for capitalists, that is before the so called industrial revolution of the mid 1800s. Exploitative and industrial it was, but certainly not revolutionary in any shape or form. In fact, one can argue that the systematic exploitation of labor, even child labor in coal mines, was one of the worst kind of historical regression in human history, and, in essence, similar to the one of Africans brought to the Americas by Europeans in this despicable crime against humanity. The perversity of it all is mind boggling. Take the United States, for example, which often describes itself as “leader of the free world” or in the words of Ronald Reagan a “shinning city upon a hill“. It was, in reality, built on two deadly sins, two horrendous crimes: the genocide of native populations, which is still “celebrated” at Thanksgiving, and, of course, the very peculiar and lucrative institution that was slavery. Nowadays everyone talks about Fake News. What about talking about fake history? 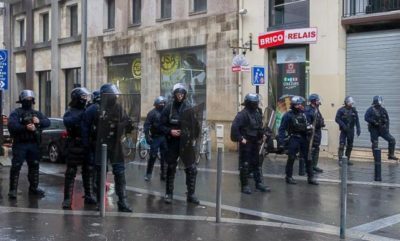 One should be cautiously optimistic, because what has become a stand-off between the power of the French state apparatus, and some of its citizens is very much in flux. But that said, the Gilets Jaunes movement, still in its infancy, has already brought hope worldwide to the poor, the oppressed, the ones that have been forgotten and even discarded by the world ruling elites like insignificant human garbage. Hope for a better tomorrow in a very harsh world, hope for empathy against a system built on selfishness and pure greed. 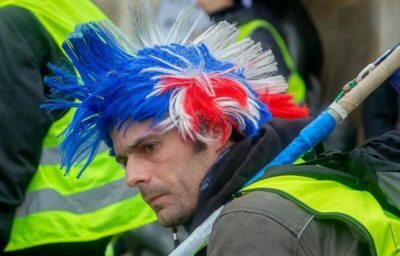 At heart, and let’s hope it stays that way and doesn’t mutate in its spirit, the Gilets Jaunes are the foot soldiers of inclusion, to reclaim for everyone a sense of community and brotherhood, fighting against the perversity of a criminal world order that is taking humanity through immense sufferings towards the final precipice of extinction. 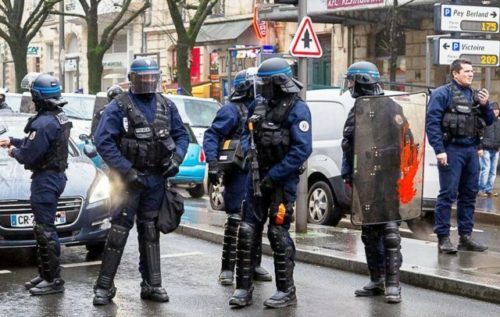 This article was posted on Monday, January 14th, 2019 at 11:04pm and is filed under Activism, Europe, France, Police brutality, President Emmanuel Macron, Yellow Vest (Gilets Jaunes) Movement.